Remember when the wedge sneaker reigned supreme? I sure do, that was only 6 months ago. It-girls world-wide wore the Isabel Marant sneakers and they became the latest ‘thing’? Those clunky, space-age lace-ups truly snowballed a revolution, pushing all others sneakers to the bottom of the pond. And then as soon as you can say I’ll take those in every color, they became ubiquitous, and every retailer under the sun quickly create their own version at every price point imaginable. This in turn prompted the trend to travel a familiar trajectory, going from top editors, to street style stars, to fashion bloggers, to everyday fashion lovers, to bargain shoppers, to mall-crawling teenagers. And now, do I still want to wear them? That wedge does add much-needed height to the petite population…but I digress. Today in debatable subjects on The Fashion Hunter: enter the slip-on sneaker. While the slip-on silhouette isn’t, in fact, new, (it’s long been favored by skateboarders, grunge-lovers, and pretty much everyone in the ’90s), it’s never truly been embraced by the couture crowd, until now. Céline, (See above pics), the arbiter of everything that’s cool and coveted, was an early adopter of the fashion slip-on sneaker, releasing $720 sneakers. This was swiftly followed by a near-exact all-black iteration by Zara, favored by a variety of hip fashionistas, and which sold out in the blink of an eye last winter. Tory Burch is doing them. Sandro Paris is doing them. Vans, duh, always did them. Obviously, when one trend goes out the window, another swiftly swoops in, and judging by a host of street style pics, fashion campaigns, and e-commerce sites, we’re guessing the slip-on sneaker is the new sneaker wedge. 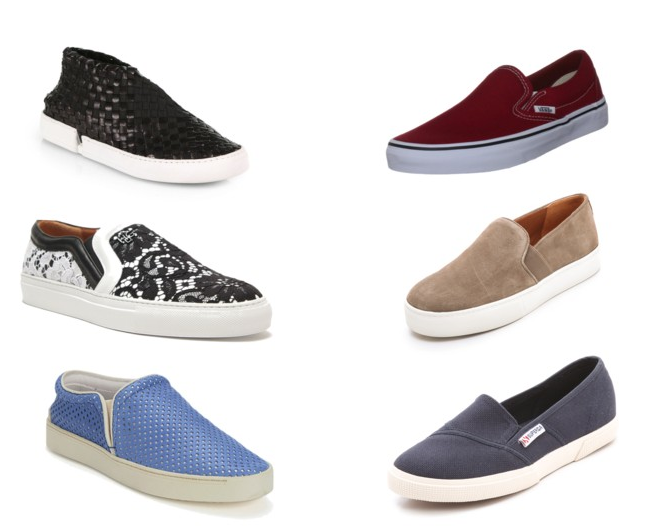 If you are a fan of the slip-on sneaker, don’t fret. Come fall, there will be plenty available. I’d be hard pressed to report that these are uncomfortable, because they’re just the opposite. Here are some laceless wonders. Edmundo Castillo black woven laceless sneakers, $490. Vans classic Slip-On, $45. Givenchy lace sneaker, $650., Vince Blaire Slip-ons, $225, rag & bone perforated slip-on, $290., and Superga is getting in on the action too, $60. Do we sense another revolution?